Sometimes known as ‘The Tragic’—a title suggested but then withdrawn by the composer—Mahler’s Symphony No 6 embodies much of the inner turmoil and superstition of its composer. Conceived at perhaps one of the happiest periods of Mahler’s life, it seems to foreshadow the personal tragedies that would later befall him—with his wife Alma writing that 'the music and what it foretold touched us deeply'. Esa-Pekka Salonen’s work with the Philharmonia for the City of Dreams: Vienna 1900-1935 concert series has produced a number of powerful, live concert recordings for the Philharmonia series, including Schoenberg’s Gurrelieder, Berlioz’s Symphonie fantastique and Mahler’s Symphony No 9—all of which have been praised by critics following their release on Signum. 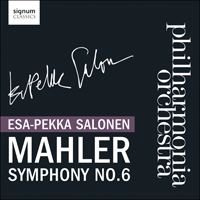 The Sixth is an extraordinary and highly individual symphony even in Mahler’s output of extraordinary and individual works. It is often cited as his most classical symphony in that it returns to a four-movement plan and uses neither solo nor choral voices. Like its neighbours, the Fifth and Seventh, the Sixth Symphony thus seems to return to symphonic tradition. But what is said less often, is that it does so not to confirm that tradition, but to wrestle with it. It takes up the legacy of the symphony since Beethoven, of heroic struggle towards some eventual breakthrough and affirmation, but presents the unthinkable—that this struggle might fail, that the symphonic hero might actually be defeated. The Sixth Symphony sometimes carries the title, The Tragic. Mahler proposed it, and then withdrew it, perhaps for the same reason that he withdrew the final and fatal hammer blow from the last movement, because he was, by nature, a superstitious man. But the original title neatly draws attention to the model that this work subverts, Beethoven’s Eroica Symphony. The hero lives on in Mahler’s music, but finds himself in a very different world to Beethoven’s. Perhaps the epithet ‘Tragic’ might be understood in the terms that Friedrich Nietzsche set out in The Birth of Tragedy (1872). The hero of ancient Greek tragedy, Nietzsche argued, must necessarily be destroyed, because tragedy is an enactment of the metaphysical truth that individual forms (represented by the hero) must inevitably perish and be reclaimed by the totality (represented by the chorus). The first movement is a march and a decidedly grim one at that. For a start, the music seems to get stuck on its tramping bass line, as if the whole orchestra were marching on the spot. The insistence of this repeated rhythm is combined with melodic lines that are stretched over wide intervals and often heavily doubled in Mahler’s orchestration to create a hard-edged sound. The uncompromising and forceful opening eventually subsides but is rounded off by a startling motto theme—three trumpets blaring out a major triad that then falls mournfully into a minor one, over a rhythm punched out in the timpani. A mysterious chorale-like passage in the woodwind provides a transition to the second theme in which, Mahler apparently told his wife Alma, he had tried to capture something of her. Certainly, it is passionate, intense and mercurial, if not rather theatrically so. The progression of the movement is shaped around the opposition of these two ideas, in which the hard energy of the march seems to get the upper hand, but this is interrupted by an extraordinary and unexpected detour—an episode inter-cut into the main narrative like a dream sequence in a film. The distant sound of cowbells and the unworldly tones of the orchestra mark this out as one of Mahler’s evocations of nature—a distant landscape glimpsed momentarily before being violently interrupted by the unprepared return of the march material. Only at the very end of the movement is there a sense of breakthrough, as A minor gives way to A major in an affirmative ending marked by all eight horns sounding out a lively return of the Alma theme. The Scherzo is generally played second though there remains disagreement on the question. This was the sequence in the first edition of the score (and the order in which Esa-Pekka Salonen conducts the movements for this performance), but at the première in Essen in 1906, Mahler decided to perform the Andante before the Scherzo, an alteration reflected in the second edition of the score. The decision changes the nature of the work to some extent. Heard second, the Scherzo immediately restores the key of A minor, reversing the blaze of the major key heard at the end of the previous movement (a kind of macro-version of the motto theme itself). The Scherzo also brings back the insistent repeated bass notes of the first movement, but the march rhythm is here displaced by a triple metre and constant disruptions by off-beat accents. As a result of the doubling of instruments and Mahler’s use of extreme registers, the tone is often deliberately harsh. But, as in the first movement, the principal narrative is intercut with an unprepared Trio episode, a strangely rustic moment which Mahler marks altväterisch (old-fashioned). Where the main Scherzo material is unrelenting in its insistent push forward, this episode seems to have all the time in the world. Such changes of mood and musical voice run through the whole movement, disorientating the listener all the way to the last bars, which simply wind down rather than end. The Andante is one of Mahler’s most lyrical slow movements, beginning as an instrumental ‘song without words’ like the Adagietto of the Fifth Symphony. In the context of the Sixth Symphony as a whole it takes on the character of a reminiscence, a sustained vision of an idyllic landscape, but framed between the threatening dark cliffs of the other movements. The principal melody exploits Mahler’s technique of dividing the line between the First and Second Violin sections, creating a sense of one melodic wave riding over the other. The idea that this movement is an idyll is confirmed by the shift from its key of E flat major to Mahler’s ‘heavenly key’ of E major, accompanied by the return of cowbells (this time heard as if close by, not in the distance as they were in the first movement). Twice the music breaks through into E major, but only momentarily. With the fall back to the main key the movement seems to confirm its own air of unreality and its status as a wistful memory, out of time and curiously distant from the rest of the work. The peacefulness of its ending acts as a foil to the eruption with which the Finale begins. Where the landscape of the previous movement was idyllic, the one into which the listener is suddenly thrown in the Finale is utterly mysterious. As the operatic smoke clears, a violent restatement of the motto theme returns us to the world of the first movement and then falls away to nothingness. What emerges from the silence is the lone voice of a tuba. Disembodied fragments of a march theme appear, but without any energy to galvanise them. Gradually, the elements are assembled into something forward moving, but each time it gets going it seems to be ripped up and has to start again. Battle ensues on a massive scale. Just as victory seems to be in sight and a breakthrough might be envisaged, the music is physically and brutally interrupted by a terrifying thud. This is the first of Mahler’s three ‘hammer blows’. In the score he directed that it should be delivered ‘like an axe blow’. In the heroic narrative of the symphonic finale, the hero should pick himself up from this appalling set back and go on to win the day. Mahler’s hero does indeed pick himself up but only to be struck down for a second time. Once more, he rises to his feet. At the very moment he seems to be about to win through he is utterly felled by a third blow, from which he does not recover. A funereal cortège of four trombones accompanies the tuba to the end. A final, horrifying scream of the motto rings out, fades and is cut off by a single pizzicato in the strings, like a clod of earth hitting the lid of a coffin.